Ever wonder how you can make trash into something useful? That’s what Food Cycle Science hopes to do with its new product, the Food Cycler. The Food Cycler is a countertop compost machine that measures only one cubic foot. Last week we talked about a kitchen multi-tool in Kitchen Tech Wednesday: Bin 8 Multi-Tool. This week’s gadget produces something you’ll never use in the kitchen: soil. Food Cycle Science, creator of the Food Cycler, says the home composter has been tested and produces safe, organic and sterilized soil from kitchen waste. The Food Cycler looks like a bread maker you might keep on your kitchen counter, but we definitely don’t recommend trying to make bread in it. The white cube plugs into the wall. You put your food scraps in it, close it, hit the power button and in three hours you have organic compost. You don’t need to add anything other than food and plant material. Composting is a great way to lead a greener life by making productive use of organic waste we throw away every day. Imagine all of the food material you throw in your kitchen garbage, including expired food, leftovers, vegetable stalks, apple cores and more. All of this trash ends up in a landfill. By composting, you’re turning that trash into valuable soil that can help you grow flowers or more vegetables in your yard. The Food Cycler takes out a lot of the hard work of making your own compost in your yard and does it in a fraction of the time. Some critics have said it looks and acts like nothing more than a food dehydrator. Another criticism of the Food Cycler is the big price tag. Food Cycle Science says the Food Cycler will retail in stores for $399. Many people already experienced in making compost think this cost is laughable, considering the cheaper alternatives available for those who are serious about making their own compost at home. If you’re willing to spend the few hundred dollars, the Food Cycler might be a good choice for those who live in apartments and simply don’t have the space to start a backyard compost pile. This kitchen gadget can also be cleaned in the dishwasher, which is always a plus. Food Cycle Science claims the compost coming out of the Food Cycler won’t smell. If you choose to buy one, have fun throwing your egg shells, coffee grounds and banana peels in there! This entry was posted in Kitchen Tech and tagged Compost, food, Food Cycle Science, Food Cycler, Food waste, Home and Garden, kitchen, range hood, range hoods on April 30, 2014 by editor. Sometimes cooking seems like a hassle when we’ve had a long day at work, but cooking can be fun if you have the right attitude. While grilling or sauteing your favorite meals, listen to this playlist of Lorde songs to keep you entertained. Whether your cooking outside on the grill or inside, make sure to keep the range hood on for ventilation. Enjoy! This entry was posted in Range Hoods and tagged Barbecue grill, Cook, grill, kitchen, kitchen vent, Lorde, music, range hood, range hoods on April 29, 2014 by editor. Super foods are natural foods that contain an impressive amount of healthy nutrients and cancer fighting properties. Super foods should be eaten fresh; they are natural and not processed. They are packed with the vitamins your body needs to stay healthy and contain high amounts of antioxidants. Before stocking up on super foods, visit our past blog post Make your Food & Supplies Last Longer for tips on increasing the life span of your fresh produce. These week’s Top 5 Super Foods are salmon, oranges, kale, broccoli and beets. To find out why, continue reading for more details about what makes each of these super foods so healthy. Salmon – It is recommended that you get two to three servings of fish every week. Like most fish, salmon is hearty in omega-3s. Omega-3 fatty acid is known to help treat arthritis, heart disease, depression, ADHD, memory problems and Alzheimer’s disease. It also contains vitamins B6 and B12, niacin, iron and zinc. Oranges – This citrus fruit is an amazing source of vitamin C. One orange will give you more than the necessary vitamin C dosage for one day. Oranges also contain folate, calcium, beta carotene, phytochemicals and flavonoids. Oranges are hailed for their anti-aging effects and ability to promote clear skin. Kale – Kale has a great number of health benefits when it is steamed. It is known to control cholesterol and contributes to detoxification of the body due its content of isothiocyanates. It is also rich in antioxidants and anti-inflammatory elements. Kale is a big source of fiber, contains omega-3s (discussed above under Salmon). Kale also reduces the risk for cancers of the colon, breasts, bladder and ovaries. 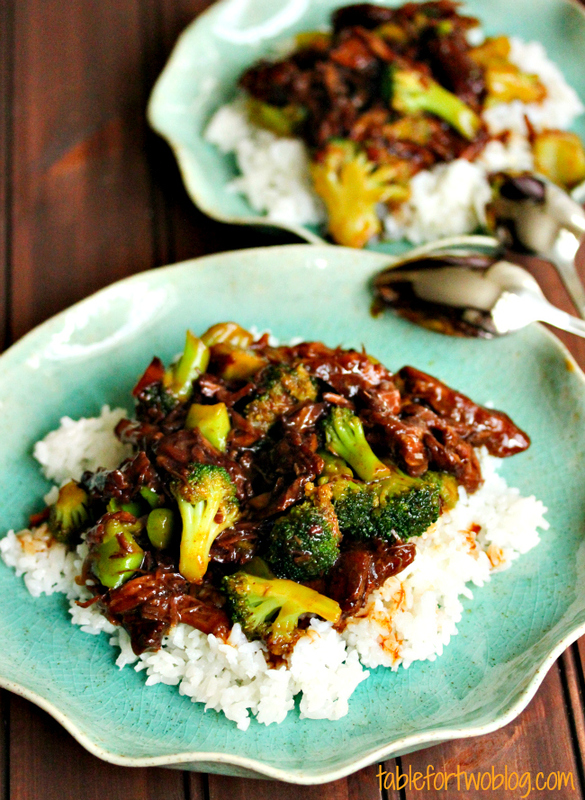 Broccoli – This vegetable originated in Italy and is related to cabbages. Broccoli contains carotenoids, which help keep eyes healthy. Broccoli also contains vitamin C, calcium, potassium and lutein. Vitamin C encourages iron absorption, calcium promotes bone health, potassium treats high blood pressure and lutein promotes cardiovascular health. Broccoli also has anti-cancer, anti-inflammatory and antioxidant elements. Beets – These roots assist with detoxification, fighting colon cancer, preventing heart disease and decreasing inflammation. Also, they contain phytonuritents that act as antioxidants. Remember not to overcook beets because they will lose some of their health benefits. The above information just touches the surface of how healthy these super foods are for the human body. Generally, fruits and vegetables contain fiber, which helps with digestion, lowers blood sugar levels and helps decrease cholesterol. Integrate the above super foods into your diet with new recipes, which you will have fun trying. Or, be creative and come up with your own favorite ways to eat fish, fruits and vegetables. 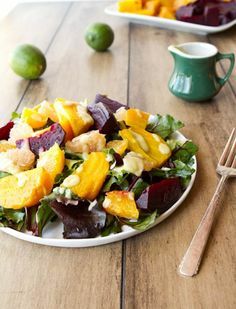 This entry was posted in Cooking with Range Hoods, Range Hoods and tagged beets, broccoli, cooking, food, kale, kitchen, orange, range hood, range hoods, salmon, super foods on April 28, 2014 by editor. This entry was posted in Range Hoods and tagged funny, kitchen, range hood, range hoods on April 25, 2014 by editor. It’s time to admit it: we all over indulged over the holiday weekend. Your relative’s brought their A-game, and there you were reaping the benefits of the best food during the festivities. And there’s absolutely nothing wrong with that. You probably also have some candy jelly beans and chocolate bunnies left in the house as well. To get you started we’ve compiled some recipes for avocado salad, “low carb” BBQ chicken pizza and a brown sugar salmon dish. 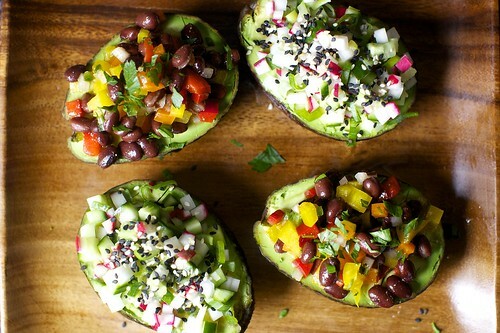 This recipe from the food blog Smitten Kitchen showcases an interesting way to eat a salad: inside of an avocado half. Deb Perelman, author, was inspired by her goal to temporarily avoid bread. The result was inspiration for her creations using lots of vegetables. She has outlined two options for the salad, the first being a black bean salad with bell pepper, onion, jalapeno and lime and the second being a cucumber radish ginger-miso salad with scallions, sesame oil, white miso and rice vinegar. To create these small salad cups, follow the instructions for the salad filling. Score the avocado, add a dollop of dressing, fill it with salad and top it with more dressing. Garnish as you desire. The secret to this pizza is in the crust. This is a gluten-free crust created with pureed cauliflower. You start by roasting the cauliflower on the stove top with olive oil. Then it is pureed with the eggs, cornmeal and Italian seasoning. Form your crush on parchment paper and pre-bake it to a crispy texture. You can then add any toppings you like. Lindsey, author of Pinch of Yum, recommends chicken coated with barbeque sauce, cheese and red onion. Bake your pizza and enjoy! This salmon recipe is super easy and unique. You brown the salmon on each side after coating it with brown sugar, salt and pepper. Broil the fish to complete the cooking process. Before serving, cover the fish in a sauce made of Dijon mustard, rosemary, olive oil and lemon. Serve with some fresh greens. This entry was posted in Cooking with Range Hoods and tagged bbq chicken, bbq chicken pizza, cooking, Easter, home, kitchen, Olive oil, Pizza, range hood, range hoods, recipe, Salad on April 24, 2014 by editor. Welcome to Kitchen Tech Wednesday, a blog series in which we’ll be sharing cool kitchen tech and gadgets from around the Internet and big chain stores. The first kitchen tech item we’ll be talking about is the Bin 8. We touched on kitchen tech in Kitchen Tech: The Future of the Kitchen. This time we’ll go more in depth about one product. It’s name doesn’t really give anything away. The only way to really describe the Bin 8 is to call it a kitchen multi-tool in the shape of a wine bottle. But that didn’t tell you much, did it? The Bin 8 saves space in the kitchen by organizing small, compact tools into one shape. The small, colorful stacking internal components of the Bin 8 come apart and perform different functions in the kitchen. All of these tools fit into the space of a wine bottle. That’s the draw for the Bin 8; you get a lot of functionality out of a little space, instead of having a kitchen drawer full of these tools. The Bin 8 also claims the funnel doubles as a flower vase, but we’re not sure how many people will actually use it for this. The other draw for the Bin 8 is the aesthetics. It’s a fun idea and it’s colorful. You can choose to keep it hidden away in a cabinet, store it on top of the kitchen range hood or you can display it on your counter top. Why not make it a part of your kitchen design? This will definitely fit into any kitchen design with a lot of color. Every kitchen needs a few items that pop out of the background and make a visual impact. The Bin 8 retails for about $27 on Amazon with free shipping. That’s a lot of bang for your buck, if you’re happy with the small and colorful design. However, some Amazon users claim it comes apart easily and may break if you drop it. Others may be frustrated by the metric units. If you do purchase one, make sure to hand wash it. 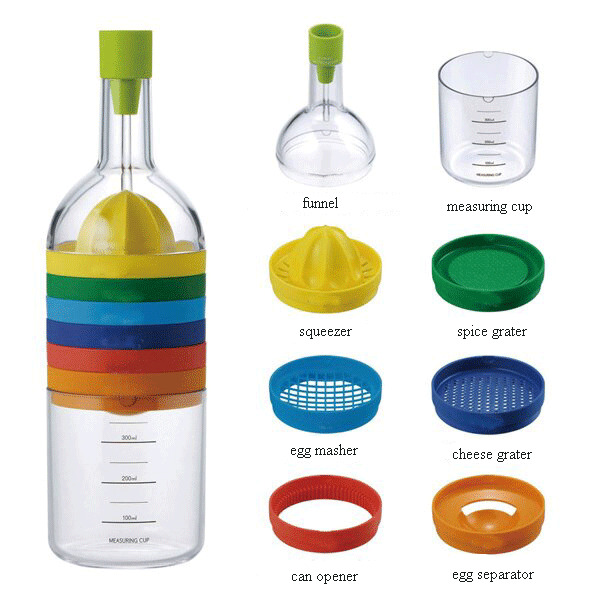 What are some of your favorite kitchen gadgets you currently own? This entry was posted in Kitchen Tech, Range Hoods and tagged Amazon, Bin 8, design, gadget, Grater, kitchen, kitchen design, Measuring cup, range hood, range hoods, technology, Tools, Wine bottle on April 23, 2014 by editor. While you fire up the grill, listen to some classic songs with “fire” in the title. Don’t forget to use your outdoor range hood while grilling or your range hood kitchen vent while grilling on the stove top. These songs may take you back to another time. Enjoy! This entry was posted in Music for the Grill and tagged adele, billy joel, cooking, fire, grill, Johnny Cash, KISS, music, steak, the doors, the pointer sisters on April 22, 2014 by editor. Some range hoods, while awesome looking, just don’t look like range hoods. Your typical range hood is made up of a chimney and hood, if it’s a wall mount range hood or island range hood. Designer range hoods, on the other hand, are unique range hoods with contemporary style and extraordinary looks. Oftentimes, the range hood becomes the focal point of the kitchen design. In these cases, the fancier the range hood, the better. This is the “wow factor” of the space. On the other hand, some prefer their range hoods to be more subtle and to blend into the kitchen décor. Some of the following range hood designs are exotic and loud; meanwhile, you would never be able to tell that some of them are range hoods with an actual purpose. They may just look like kitchen lighting or decoration. These are much more exciting and luxurious ways to hide a range hood than the typical range hood apron or exterior. This futuristic range hood from Elica looks like a circle mounted to the wall. Don’t judge a book by its cover or let looks fool you; this is in fact a working wall mount range hood. It has 600 CFM, measures 31 inches in width, is a high performance range hood from Elica and comes in white or black. That’s a pretty powerful range hood for something that looks like a wall clock. Elica also put its deep slience technology into this hood, so it’s supposed to be one third quieter than other hoods on the market. This island range hood, designed by Fu-Tung Cheng for Zephyr, is unlike any other island range hood we’ve ever seen. What really sets this design a part from other range hoods is the suspension structure and the curved canopy. The curved canopy will catch smoke and air that floats up from the cooking surface. The range hood itself looks like it’s floating. Fu-Tung Cheng is known for his luxury designs and for his work with concrete. He is a master of colors and textures. This hood has 1000 CFM, comes in 60, 54 or 48 inches and has Bloom HD LED lighting. This Mirage wall mount range hood is unique in the fact that its canopy is created with hand blown glass. The 22 gauge stainless steel chimney and glass canopy make a bold statement and creates an interesting juxtaposition of color and material. This range hood looks good and employs the latest technologies. It has 450 CFM, electronic touch control, a 8.5 sone centrifugal blower, a filter maintenance indicator and recessed halogen lighting. The filter is dishwasher-friendly and it fits 8’ to 10’ ceilings. Is this a disco ball or a range hood? Here’s another design from Elica that surprises us. No, this is not a disco ball, it’s a range hood with 300 CFM and a magic wand control. This 19 inch range hood is a part of Elica’s Evolution range hoods, which are created to blend into the rest of the kitchen. It is made of stainless steel and glass and produces ambient light for cooking and for anything you do in the kitchen. This looks more like a chandelier or dining room lighting than a kitchen range hood, and that’s exactly what Best was going for with this hood. Best calls this a “ceiling sculpture” and we believe it. It has 450 CFM, measures 39 3/8” in width, recirculates air and has four speeds. This range hood uses charcoal and mesh filters and the controls are hidden. The lighting is made up of six halogen light bulbs. This looks just as much like decoration as it is functional for kitchen ventilation. At the end of the day, range hoods are important for ventilating smoke, grease and smells from the kitchen. But that doesn’t mean we can’t have some fun at designing them or hiding them. This entry was posted in Kitchen Design, Range Hoods and tagged design, Elica, kitchen, range hood, range hoods, Ventilation (architecture) on April 21, 2014 by editor. Not sure if range hood is broken, or kitchen is on fire. This entry was posted in Range Hoods and tagged design, Fry, Futurama, home decor, kitchen, meme, range hood, range hoods on April 17, 2014 by editor. With Food Prices Rising, How Can I Save Money? It’s continually reported that food prices are going up. Within the last year, food prices have increased 1.4 percent. The same dollar may not go as far in the grocery store as it used to. Unfortunately, we have to make more careful choices about where we shop and while we’re shopping. As people try to save money, they cook more at home. Remember to cook with the range hood on at home so your kitchen will be properly ventilated. Cooking produces grease, smoke and smells, all of which you do not want building up in your kitchen while cooking food you just brought home from the store. To be more specific about the cost of food, the cost of fruit has gone up 3.1 percent and the cost of vegetables has gone up 1.6 percent. These raising costs can be attributed to drought and a lengthy winter. The cost of meat grows the fastest. There is less cattle available in the country; meanwhile, the price of feed is increasing. When people have less to spend, they’re more careful about where they spend it. People become more concerned with the quality of food, the service they receive and the experience they have at the store, the prices of the food and the cleanliness. Some of the best super markets in the country include Whole Foods, Costco, Sprouts, Trader Joes, Stater Bros and Sam’s Club. However, Whole Foods is the most expensive. To save money while shopping for food, always check the unit price of the item. The unit price is the cost per pound or ounce of the product. Simply comparing price tags on different sized items doesn’t give you the right idea about which choice is more affordable. Also, remember to bring coupons to the store with you. Some rewards programs now offer phone apps or emails from which the coupons can be used in the store. When you’re browsing in the super market, don’t be afraid to purchase an off-brand or the store chain’s version of the same, popular products. Try Kirkland, Kroger, etc. and you may find that the off-brand product is as good, or even better, than the brand name. Buy food in bulk and bagged produce. Separate the food when you get home. If necessary, cut up the food, separate it and freeze it for later. You can buy non-perishable items in bulk from websites like Amazon.com, especially if you have a Prime membership with free shipping. We wish you the best of luck while shopping and cooking your meals. This entry was posted in Range Hoods and tagged cooking, Costco, food, Grocery store, kitchen, Kroger, range hood, range hoods, Sam's Club, shopping, Stater Bros, Trader Joes, Whole Foods on April 16, 2014 by editor.